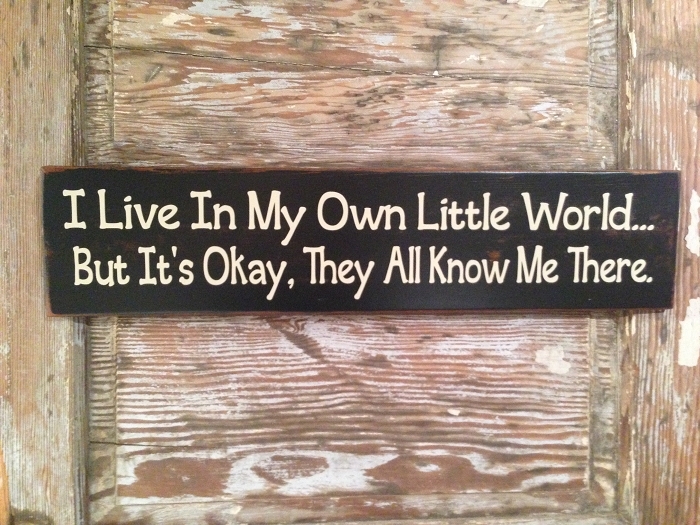 I Live In My Own Little World... But It's Okay, They All Know Me There. This sign measures approximately 5 1/2" x 24. It is a Black Sign with Beige vinyl lettering. The sign is distressed and sealed for years of enjoyment. It includes the saw-tooth hangers attached and ready to hang. This sign is hand crafted and created with care. It is overall distressed before the vinyl lettering is applied so each sign is unique with its specific highlights on the wood grain to that individual sign. A Black sign with Beige Lettering is our standard color combination and our best seller. This combo can be ordered by simply selecting "As Pictured" from the Pull Down Menu.